What better way to enjoy the highlights of London than from on board a Classic 1950’s Route-master Bus with a live professional guide? Enjoy great views of the capital’s iconic sights, both old and new, including Big Ben, the Houses of Parliament, Trafalgar Square, St. Paul’s Cathedral, London Bridge, The Shard, Tower Bridge & the London Eye. 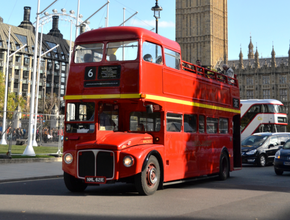 The Vintage Double Decker Bus Tour includes a photo stop at Westminster Abbey, burial place of Britain’s monarchs and the host for coronations and many royal weddings since its construction in the eleventh century. The bus stops again for photos at the Tower of London, multi-functional throughout history as a royal palace and a fortress, a prison and a place of numerous executions. Join us at the Tower of London that was built nearly a thousand years ago and is now home to the Crown Jewels protected by the famous Beefeaters. The imposing former palace was once used as a fortress and a prison and you can see Traitors Gate where prisoners entered the Tower for the last time!. We stop for photos and a history lesson from the guide before our cruise. Enjoy our new private and exclusive river trip that passes Shakespeare’s Globe, Cleopatra’s Needle, London Bridge, The Shard and Tower Bridge. Enjoy the magnificent view of Tower of London from the private chartered boat from the river before we arrive at Milbank/London Eye pier. 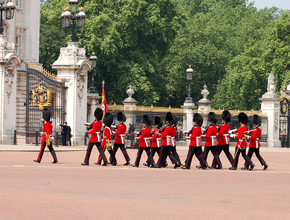 Buckingham Palace is the official Royal residence of Her Majesty the Queen, and we make our way to the perfect spot to for photo opportunities to see the Queen's guard dressed in their fabulous tunics and busbies. Transport yourself back to the darkest moments in the capital’s history within the deep depths of the London Dungeon. Live actors, shows, rides and interactive special effects ensure that you face your fears head on in this unique experience. Everything that you see is based on real historical events from Jack the Ripper, to the Great Fire of London, torture and the plague. With two scary rides the London Dungeon provides a thrilling and fun experience that will leave your family screaming for more! Ninety minutes of thrills and chills… are you brave enough? Are you brave enough to cross the threshold of Sweeny Todd, the demon barber of Fleet Street? A short back and sides (1785 - style) could be just the thing to round of your visit...But will you get more than you bargained for? Keep your wits about you to make sure you don't become the next filling in Mrs. Lovett's famous pies! Embark upon your last journey on Extremis: Drop ride to Doom! At the mercy of the hangman, you are at the very point of death and the end is drawing near... Taste the fear and feel the adrenaline pump as you drop, screaming into the darkness below...! 1888, and the fear rises inside you as you enter Jack the Ripper's Whitechapel. As you wander the stinking slums the true horror of his terrible crimes is reveled in bloody, graphic detail. And then a scream. the flash of a cloak and an evil smile as you come face to face with Jack the Ripper himself... will you survive? 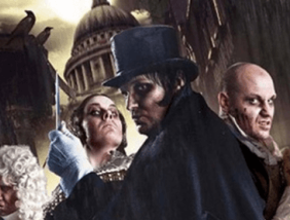 The tour ends at the London Dungeon leaving you ample time to enjoy the attraction. Please note that the tour ends at the venues and no drop-off back to Victoria is provided. From 1st November 2017 there will be an English speaking live guide only.